Ronald is such a penny-pincher. He will only buy something if he has a coupon or if it is on sale. Meaning: a penny-pincher is someone who is very careful with money. In the example, Ron makes sure he never pays full price for anything. Our budget is tight this month. We have to pinch our pennies until my next paycheck. 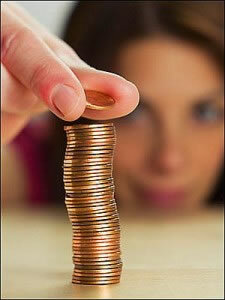 Meaning: to pinch pennies means to be careful with all your money, even small coins like pennies (1 cent coins). You can insert a possessive adjective when talking about a specific person's money. She should pinch her pennies. We must pinch our pennies. I didn't pinch my pennies, now I'm broke.